Designed to take their breath away, this 9ct white gold 3/4ct diamond cluster ring features a stunning collection of brilliant cut diamonds set in four claws of white gold. 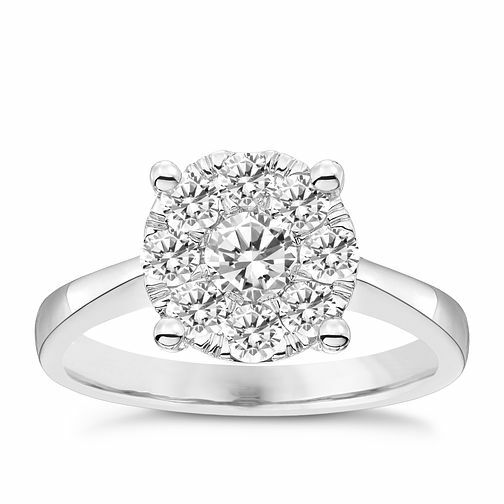 9ct 3/4ct Diamond Solitaire Cluster Ring is rated 1.0 out of 5 by 1. Rated 1 out of 5 by Anonymous from Don’t buy!!! I got given this as an engagement ring and twice the diamonds have come out of it, in the exact same place. Staff so unhelpful when trying to sort this and I am now having to get a whole new engagement ring as a result due to my wedding being so close. So disappointed.